Alt tags are quite important, but maybe not for the reason you think. They say an image (even on websites) is worth a thousand words. Today we’re going to talk about 5 to 20 of those words. But first, why do we care about images on a website? Well, because text alone is BOOOORING. Because people like to look at purdy pickshurs. Because images capture the attention and evoke a feeling or mood. Because some people gather information better visually. Because images, if used appropriately, draw a person in. So we really need to have images on a website. That’s a given. But while images alone are important, when placing them on a website we also have to imbue them with written-word characteristics. There are a couple of primary places to do this. The first place is the image’s file name. For the image above we have limitless choices. Which one do you think is the best? If you picked #4, you win! The file name, nice and short, pretty much describes exactly what the image shows. That’s a cue, especially to search engines (as visitors don’t tend to pay much attention to image file names), as to what the picture is about. If you thought #5 or #6, it’s a common mistake. Search engines prefer hyphens over underscores to differentiate words. Combining words is confusing. Search engines may think “beedaisy” is one, nonsensical, word. #1 is the kind of file name you get from your camera. It says nothing about the picture, other than very obliquely references when it was taken. If you picked #2, you win the “Blackhat SEO” award! That’s an attempt to “stuff” keywords into an image file, trying to get search engines to think that the image is about something it’s not. Not recommended. The second place is the “alternative text” tag or “alt tag” (or sometimes “alt text”). Whenever you upload an image to a website, you have an opportunity to associate alternative text with the image. You really must take advantage of the opportunity. This is a chance to tell search engines and visitors concretely what the image is about, as well as to help visitors when they are on your site. In the image above, not only are there limitless options for file names, but too there are infinite alternative text options. Which one do you think we’d use of the options below? Bee extracting nectar from a daisy. Lots of pollen! Buy your Viagra(TM) at our Canadian pharmacy today! We know you “Blackhat SEO” types went with #6 or #7, because you like to try to game the system and are counting on Google never figuring out exactly what you are doing. Good luck with that. We’d go with #5 of course, because it describes precisely what is in the image. And one would assume that we are using the image on a page of content that bears a relationship to the image. But even if the image is not directly related to the written content, we’d still use the alt text in #5 because it describes the image. 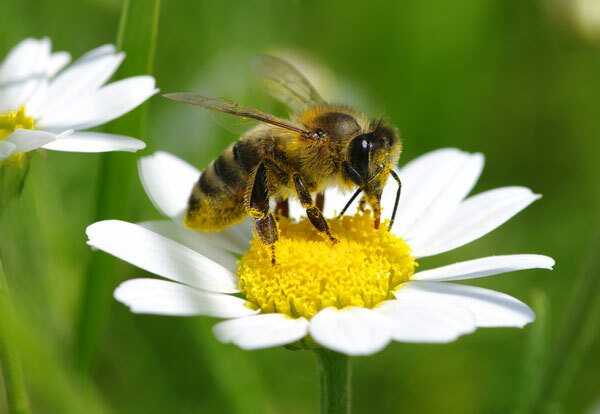 (This post is a case in point: The post is about alt tags in images; the image is of a bee extracting nectar.) Of course, most often, the images you use will have a relationship to the written content on the web page where you’ve placed the image. That’s a best practice. Another best practice? Be concise. Here’s some good (non-legal) advice from others on using alt tags from Google and from the makers of the Yoast SEO WordPress plugin. You’ll have an opportunity to add the alt tag to images regardless of your website’s content management system (CMS). Nevertheless, below we are going to focus on how the WordPress CMS deals with alt tags, because it can be confusing. There are a couple of ways to add images to a WordPress website. You can upload them directly to the media library, or you can add them to an individual page or post as you go. If you place an image into the media library, you can (and should), after upload, edit the image to add the alt tag. That alt tag becomes the “default” alt tag. If you’ve given the image in the media library an alt tag, when you later place that image in a post or page, the alt tag comes with it and will show (in the background if the image is showing) on that page or post. Once you place an image in a page or post the alt tag is effectively “fixed” and will not change unless you manually edit the image in the page or post. This is true even if you later change the default alt image tag in the media library. If an image has no alt tag set in the media library, you can set the alt tag on the post or page. If you do that, that alt tag will be set only on that post or page, but not in the media library. The default alt tag in the media library will continue to be null. To summarize, the default when adding an image to a WordPress post or page is that the CMS will use the alt tag set in the media library if one exists. If none exists, none will be set. The alt tag on any post or page can be edited and such editing will not affect the alt tag –or lack thereof– in the media library (unless you are editing the “attachment details”). At the same time, changing the alt tag in the media library will not change the alt tag on any page or post already using the image. Watch our helpful alt tag image tutorial video. Now go out there and set those image alt tags!